The Colorado state legislature is back in session and that means it’s our first look at how anti-fracking legislators are attempting to bolster their creds with “Keep It In the Ground” activists, especially as we move into election season. Enter State Rep. Joe Salazar — he’s running in the Democratic primary for attorney general of Colorado. For the upcoming legislative session, Rep. Salazar has announced he is introducing a series of bills targeting the oil and gas industry. One sticks out in particular, given that even one of the lawyers working hand-in-hand with the national group that prompted it, Our Children’s Trust, warned Rep. Salazar about the merits of the bill. Recall first that Rep. Salazar is very upfront about his outright opposition to fossil fuels and his work with numerous national ban-fracking groups, something EID has documented numerous times. Here are the top four most egregious examples that sum up just how extreme Rep. Salazar’s anti-fracking crusade really is. Recently, Rep. Salazar joined the national anti-fossil fuel group 350.org at a “Tour de Frack” rally, stating simply “I don’t believe the data” that shows oil and gas development is safe. Just last month, Rep. Salazar said he’s all in for the new (yet old) ballot measure that’s currently making its way through the ballot measure approval process, as EID reported. 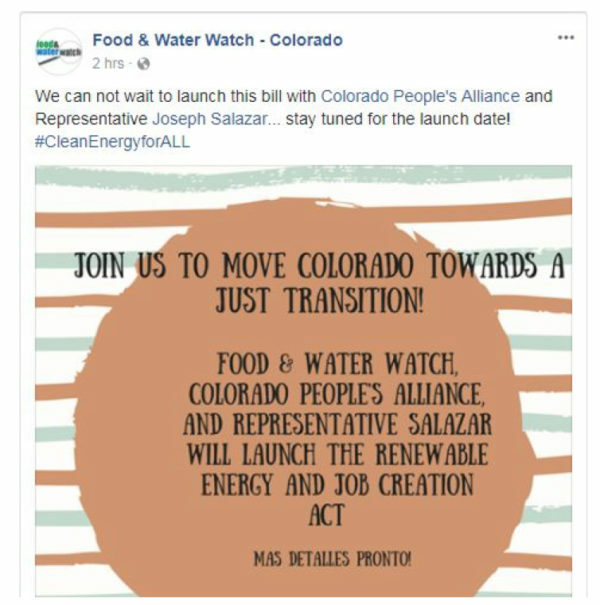 Rep. Salazar literally says out loud on the internet (the place where information lives forever) that he’s “working on such an amazing bill with Food and Water Watch,” another well-documented national anti-fossil fuel group. The scary part is — this is 100 percent true! See below. Put simply, it should come as little surprise that Rep. Salazar would back a bill, no matter how ridiculous it is, for the simple sake of working with activist groups. So, let’s have a look at the “Regulate Oil and Gas Operations to Protect Public Safety” bill (aka the “Martinez/Earth Guardians Bill”) that even Our Children’s Trust co-counsel is raising questions about. What is the Martinez Bill? To kick off that first week the state legislature, Rep. Salazar introduced House Bill 18-1071, which seeks to “codify” a ruling in an appeals court that is currently awaiting response from Colorado State Supreme Court as to whether or not it will take it up for a review— meaning it hasn’t even been fully adjudicated yet. But Rep. Salazar didn’t let that fact keep him from bringing forth this bill in attempt to make one legal ruling into a law. The aforementioned appeals ruling pertains to a lawsuit filed by teenage environmentalists who are backed by a number of national “ban fracking” groups. It would make proving that proposed development does not “adversely impact human health and does not contribute to climate change” a condition of the permitting process. The Colorado Oil and Gas Conservation Commission (COGCC), which regulates the industry in the state, voted unanimously to appeal the decision, which was backed by current Attorney General Cynthia Coffman. Questions Raised By… Martinez’s lawyer? 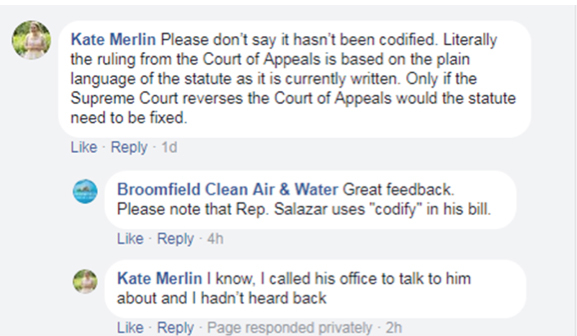 The below Facebook exchange between Kate Merlin, one of the attorney’s representing the children involved in the “Kids’ Lawsuit,” and ban fracking group Broomfield Clean Air & Water shows that Merlin finds Rep. Salazar’s HB18-1071 legislation is unnecessary now. Well that Facebook exchange isn’t awkward at all. 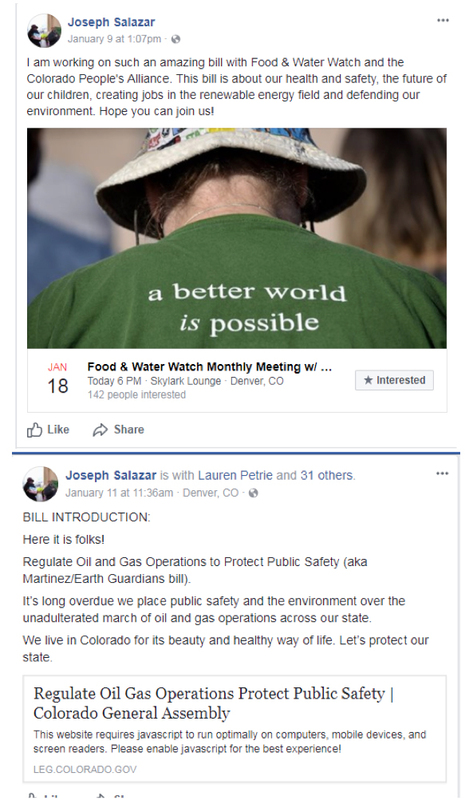 With that in mind, it should be interesting to see how Rep. Salazar’s House Bill 18-1071 — or as Rep. Salazar calls it, “Martinez/Earth Guardians” — will fare through the legislative process, as its first hearing has been scheduled for Feb. 1 in the Colorado House Health, Insurance, & Environment committee. It will also be interesting to see how Rep. Salazar’s anti-fracking, ban fossil fuels rhetoric will play in a statewide race given strong bipartisan support in the state for the industry — especially if he continues to openly work with national ban-fracking groups. As EID has previously noted, Colorado Petroleum Council Executive Director Tracee Bentley pointed out “major economic risks” the ruling carries for Colorado’s oil and gas industry – an industry that a recent report says provides Coloradans with 78,300 direct industry jobs, 83,500 service jobs, 22,600 wholesale and retail jobs, and 4,800 manufacturing jobs and nearly $23.1 billion in wages in 2015. The Martinez ruling isn’t good for Colorado and neither is Rep. Salazar’s work-around bill, House Bill 18-1071. Despite these truths, more anti-fracking extremism is bound to pop up both in the state legislature and on the campaign trail for Rep. Salazar. Stay tuned.